Japan has been home for over four years now, crazy even saying that, and as much as we love Tokyo, we also know that our stay here is not indefinite. When moving abroad it’s common to think of all the neighboring countries to visit rather than the country you reside in, which has been our focus in the previous years. Although we still have a few places in Southeast Asia on our bucket list we’ve decided to concentrate on exploring this whimsical country as much as possible before our hypothetical sayonara. We took the plunge, bought a car and are taking advantage of the quick escapes out of the city. 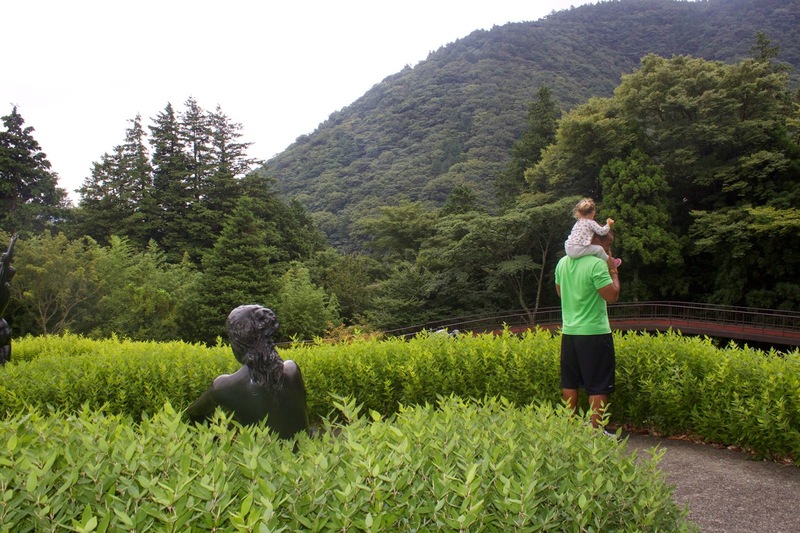 We recently went to a place called Moto-Hakone, near Mount Fuji on Lake Ashinoko. It was an easy two hour drive out of Tokyo and extremely kid friendly. Moto-Hakone is known for it’s huge Tori Gates. One in the water, which is lit up in the evening, and another that greets you at the entrance of the town. This is the Jinja Shrine, a subtle centerpiece to the lake and mountains. Large ferries remodeled into Piratte ships take tourists up and down the Lake. On a clear day this would be an immaculate view of Mt. Fuji, however still gorgeous. The town is quaint and very charming. A lot of restaurants and souvenir shops. Letting Maya get at taste of nature and explore the grounds near the Jinja Shrine. If there is a hallway, she will run! Running through the Prince Hotel like she owns the place. On our way out of town we stopped by the Hakone Open Air Museum, with little to low expectations of a museum in the middle of the mountains. To our surprise it was one of the best museums we had visited. Beautiful sculptures and statues were sprawled throughout an enormous landscape, a children’s attraction was placed in the center and a 300 piece Picasso collection was the icing on the cake. It was a wonderful getaway into the mountains and a nice break from the city. We look forward to more roadtrips throughout Japan.